Shocker is a living battery, complete with battery acid for blood. 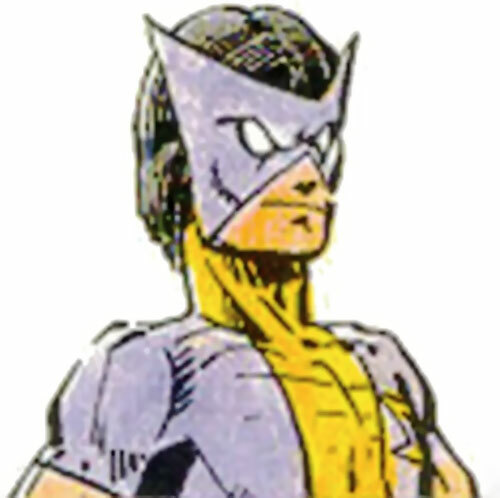 He is able to secrete acid at will but rarely does so, preferring to throw tremendous lightning bolts instead. His mental control over the currents he generates is so fine he is able to exercise control over some electrical devices as well. John Shakura is a half-Japanese, half-American who lived in Japan. While working at a chemical plant he fell into a vat of battery acid. Somehow this mutated his body and gave him his powers. Johnny isn’t the criminal type, but was talked into it by his more charismatic cohorts. He is madly in love with Evergreen of the Crusaders. Though he may fight her, if any of the Crushers schemes seriously endanger he will come to her aid, whatever the cost ! A minor foe for starting heroes. EMP and Interface only work on electronic devices (-1FC each). EMP, Interface, and Lightning are all Contingent on Electric Being (-1FC each). Altered Anatomy, MIA (Evergreen), Misc. Physical Restriction (Blood is highly acidic. If Body damage is taken Acid will uncontrollably attack everyone in a 0 AP radius). 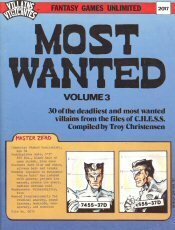 Helper(s): Hart!, Villains & Vigilantes Comic Book, Roy Cowan. Source of Character: Villains & Vigilantes.